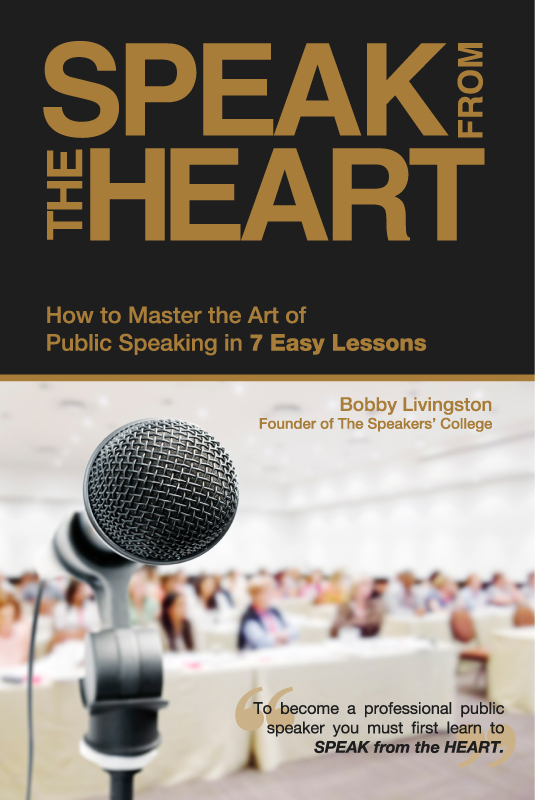 I absolutely loved and heartily recommend Bobby Livingston’s book, entitled SPEAK from the Heart: How to Master the Art of Public Speaking in 7 Easy Lessons. He advocates a simple yet powerful approach to public speaking; namely speaking from the heart. Bobby’s obvious passion for public speaking comes through in his writing. What I found great about his book, is how he builds up the art of public speaking by giving examples of people who found it difficult to speak publicly, and whose performances were completely transformed when they spoke from the heart, such as Sir Winston Churchill. Bobby through his writing enables you to believe that you are also capable of such amazing feats. The book is split into easy to read lessons of which there are 7 in total. Each has its own objectives, then the actual content of the lesson, and then a challenge at the end. The challenges throughout the book are excellent, which guide you step-by-step to help you prepare yourself for giving a speech and then actually delivering it. Each challenge helps to increase your confidence in public speaking. What Bobby does at the end of each challenge is to ask you question, so you can really reflect on your performance. What I appreciate about the book, is that Bobby really emphasises how public speaking is a creative art and not just about getting up to speak, and how doing so creates a strong energy between you and the audience! He talks about the importance of removing those bad habits that we all get into, and get rid of the “ums”, “ers”, “ahs”, “you know”. We’re all guilty of them, but saying them certainly does not help giving an elegant and fluent speech! He discusses about speaking correctly grammatically, and how to slow down your speech and really enunciating your words for dramatic impact. Bobby explains how you can increase your confidence by using words that convey conviction, belief, passion, and purpose. This creates a positive “energy thread” and the more positive you begin to feel the stronger and stronger your message becomes. Bobby includes a sample speech, which you can use to do the challenges throughout the book. Another brilliant challenge in the book is speaking, recording yourself and then listening for the areas where you can make improvements. Who isn’t mesmerised by an inspiring speaker? With such a person, who wouldn’t to hear them speak? Bobby explains in useful chunks how you can achieve this, through developing the skills of an actor to then bring into your speech, such working on your emotions, and demonstrating these to go with the changes in your speech. He shows ways of accessing moods and becoming aware of them by listening to classical music. For instance, if the music is conveying sad and angry moods, then as you’re sensing these particular emotions, say words that come out of your mouth. The book also effectively explains how to use the power of eye contact, gestures and body movements, and expertly teaches how to use these when giving a speech, to support and express further what you’re saying. One approach I liked in particular was practicing responding to the different sounds in a piece of music such as tension and intuition. He explains how our gestures become visual images, which are then, are appealing to our audiences. However, he also explains how not to use body language and what could be considered to be off-putting to the audience. He teaches about posture and what makes an honest approachable stance and what makes a fearful one. He describes the importance of appearance and hair when speaking and how to achieve the appropriate effect depending on the type of audience you are speaking too. A great section is how to make your voice more powerful through making changes in volume, and tempo to ensure you are heard and the words you say sound interesting. Modulation is also explained as varying tones and pitches can add warmth, sincerity and passion to our speeches. He teaches good techniques on how to write a captivating speech, and explains the key components that make up such a speech along with what needs to go in each part, so your speech has a seamless flow. Other aspects covered are how to develop understanding with your audience, so that you gain trust with them and are able to create momentum and gain commitment from them. This is particularly important if you are giving a speech in a sales context for instance. The book ends with a great exercise on evaluating professional speakers and Bobby has included an evaluation guide to help you do this. And then there is an exercise on evaluating yourself! SPEAK from the HEART is easily the best text I’ve read on public speaking. I would like to congratulate Bobby Livingston on his quite brilliant book. You can order the book from Amazon. Please note: I have no affiliate connections with this book. Have you had experiences with public speaking? Or have you thought about giving it try? Please leave a comment and share your experiences and thoughts on this fascinating subject. Great review on Bobby’s book, Hiten! I am heading over right after I leave this comment to put it in my queue of books to read. I have had a couple of experiences in the realm of public speaking; nothing in an actual group setting as of yet. However, I hope to get the opportunity real soon to test the waters a bit. There’s still a lot of preparation and practice needed on my end, but I believe that experience is the best teacher. I have a few online speaking engagements coming up that I’m currently preparing for; one of which has been ongoing for several weeks now. I believe that it has been an awesome opportunity and wonderful practice for me. I’ve learned a lot thus far, but again, I know that there is still so much more that I’m in need of learning and teaching myself. This book sounds like another great tool to invest in to acquire the skill in public speaking that I seek to possess. Thank you for sharing your thoughts on it, my friend. Great job here! Deeone Higgs recently posted..Would You Allow Your Gifts to Be Stolen? What is Deeone’s Coffee With Soul presentation? I’m really glad you liked the review. It really is an excellent book. I love the way Bobby has written it, so it is simple to follow and easy to read. Indeed, experience is the greatest teacher. I totally agree with you on this. It’s the same with public speaking too. I’ve been public speaking for around 5 years now, and it still amazing to see a new speaker turn up for the first meeting, really nervous and scared about getting up and speaking. Just turning up for the meeting is a great thing to begin with. What are your online speaking engagements about? Thank you so much for leaving your comment, and sharing your experiences with public speaking Deeone. Thanks for responding to Hiten’s blog about my Speak from the Heart book. I denied for years that I had the ability to speak powerfully in public. You can do it too my friend when you begin to explore your self-awareness. In the process you will begin to sow the seeds of success for future performance. You, like I was back then, are on a great journey in the world of public speaking. Hang on in there and the rewards will come. Happy reading. Wow, Hiten … I could tell you really discovered a treasure trove of golden nuggets in “Speak from the Heart”. Great book review — thanks for sharing. Only 7% of communication is either written or spoken. So that means pubic speakers REALLY have to hone their body language skills! The greatest challenge for those of us doing audio interviews/guest speaking gigs via teleseminar is obvious … attendees can’t see us … so we don’t have the added benefit of using body language to convey a message. Believe me, it’s a tough assignment. Thanks for transforming your blog into an ever-flowing fountain of enjoyable articles and helpful tips. I love eye contact communication. A person can say all they want and act all they want, but their eyes will tell us a lot about what they are like! I really appreciate you commenting on the percentages corresponding to verbal and non-verbal communication. This demonstrates how important non-verbal communication really is, and how we can improve how we communicate drastically by working on such aspects. How do you work on your body language skills when public speaking? It would be great to hear your views on this. I totally agree with what you said, about the challenge associated with doing audio interviews, and not being able to see people’s body language. This reminds me of when I do telephone coaching. Telephone coaching works great, but it’s not quite the same as having a client sit in front of me. Mel! Fancy meeting you here. I *love* what you said about 7% verbal. I used to be a hyper-intellectual guy, able to “out-argue” anyone and “be right” using my words. I thought that was the key to life. Heart and emotion is so important, and I’m so happy I learned that. Lastly, I *love* my voice and presence, and tough-assignment or not, I feel that moving and impacting people with it powerfully, is totally do-able. Yes, Mel is one of my good blogging friends and a regular reader over here. I saw her over at your blog too! Mel always adds great insights in her comments! I’m glad that my comments about non-verbal communication resonate so strongly with you. I hope you find my approach expressed through the book to be of great value. The other day, I watched in amusement as a speaker literally spoke from the heart without even realizing. He took the stage and spoke passionately, everyone was really touched. Then he said without thinking, “Let me now read the speech they wrote.” No one could believe it. I laughed until I cried. Maybe some speakers are stifled and can’t really speak from their hearts. Because of certain circumstances…who knows? I feel speaking from the heart is best for both the speaker and the audience. The speaker you saw, sure does sound like a passionate speaker, who speaks from the heart quite naturally! This is amazing. Where did you see this person? Is there a YouTube video on him? Public speaking really is a skill we can all develop. So to can we develop the ability to speak with strong emotion and from our hearts. What I’ve found useful, is to trust my mind to let go completely, and say what I want to say spontaneously. I’ve found when I do this, I speak with more passion. I’m continuing on developing this skill further. You are spot on! Speaking from the heart is good for the speaker and the audience. I actually describe speaking from the heart as being a cathartic experience. You become in tune with yourself and resonate soulfully with your audience. In the process nervous energy is transformed into powerful performance. Your example highlights this so clearly. Why? Because as you say the person who spoke was “human” and we all love that wonderful expression of human honesty. Thanks for responding Veeh and I hope you will enjoy the book too. Hiten! Rock on, man! This is fantastic. It’s such a breath of fresh air from most advice on speaking I’ve come across. Some preachers really, really know how to move a crowd. It touches on a main tenet of Ryze’s teachings… Be Real. Do *everything* with heart. Speaking, blogging, f***ing — whatever. Whatever you’re doing, come from the heart. Show your passion, animate and express your emotion. I know that vibe radiates in all I do, and I know people feel it. I’ll offer a fresh perspective on “ums” — when I get really, really passionate, sometimes my speech hesitates as I lean in and summon the proper language. I like that about myself and my speech. It adds to my brand, makes me memorable, and helps people know I’m human and that they can succeed no matter what conventional wisdom says. I’m masterfully articulate and able to tune up or ‘dumb-down’ my words whenever necessary. My ideas are creative and flow out naturally. Basically, I think there’s room for a speaker who leverages “ums” in a powerful way. It’s wonderful to hear also, that what Bobby is teaching, is in line with the values of Ryze and as you say “Be Real” and do “everything with the heart”. You have a wonderful message you are spreading to the world Jason. Please keep this up! I do agree with you Jason. If the speech is ‘real’ and passionate, then I can see how the “ums”, could be used effectively, to add to the whole personality of the speaker, and the speech being given. I’ve just watched both of your videos. Thank you so much for sharing these Jason. The second one with you speaking to the entrepreneurs was brilliant. You spoke amazingly. You had a clear voice, great rapport with the audience, and amazing body language. The language you used was inspirational and highly persuasive. You are definitely a top speaker. What type of training did you give yourself in speaking? It is fitting for a review of a public speaking book. Thanks for responding to Hiten’s blog. It is great to hear an articulate speaker convey energy and heart. We share the same passion so I hope you too will enjoy Speak from the Heart. I agree with you. Jason does have tons of energy and heart when he speaks! Thanks for a phenomenal review. My simple belief is that “to become a professional public speaker you must first learn to speak from the heart.” It is so encouraging to hear from Deeone, Melanie, Jason and Vechcirra – thanks you for responding to Hiten’s blog. All of you are on a public speaking journey. It would be just awesome if you too read the book and experienced the artistic, creative and intuitive forces that emerge from my approach to public speaking. My approach is to focus on the artistry before technique. Why? Because it is the only way I have ever seen speakers who have attended every training course going or spent years practising in speakers clubs transform from the ordinary to the outstanding. Or as I put it “to become a professional public speaker you must first learn to speak from the heart.” Happy reading folks and do let me know how it changes not just your public speaking skills but your life and career prospects too. It was a true pleasure and a privilege to have had the opportunity to review your most brilliant book. Indeed, I’m very pleased my readers have received this review so well, which is evident from the discussions taking place. Many thanks for your kind, wishes to us all Bobby. So true Hiten. I find it so much easier and relaxing to speak to others and write from the heart. When I just use my mind I feel like I am leaving out something. Indeed I agree with you, my friend. Using the mind alone for communications completely misses the true impact that can come from combining our hearts with it. You have hit the nail on the head with that comment: “when I just use my mind I feel like I am leaving out something.” Sadly, many speakers feel exactly the same way and are stuck, struggling to communicate yet knowing there is so much more they can give. That is why I always encourage word and expression creativity before technique. I hope you will enjoy Speak from the Heart as by the sound of it it is made for someone just like you. Thanks for taking the opportunity to respond to Hiten’s blog. You are right “words are just words” and funnily that thought was the starting point of my book. I questioned why it was that some people could “add the right substance” whereas others could not despite years as members of speakers clubs or having taken very expensive training courses. And the reason that came through time and time again was that they hadn’t yet learned to Speak from the Heart; they hadn’t learned to let go, to just relax and be naturally artistic and expressive and thus they stymied their words and ability to impact. Words are just words but add intuition, energy and creative artistry to the mix and they become powerful beyond measure. I hope you take the opportunity to enjoy Speak from the Heart. I’m so glad you liked the review and thanks for adding your insights to the post. Indeed language is just a set of words. I agree with you on this. It is when we add the right emotions to the words that their power really arises. When we do this, we then create an opportunity for our words to have a magical effect on others, as we connect, entertain, persuade and influence. Bobby’s book sounds wonderful! Most of us have a fear of public speaking and we need all the help we can get. I think it’s also a challenge for most people to share something of themselves and speak from the heart for fear of rejection. They need to overcome this fear so that they can start connecting with their audience. Thanks for sharing this book with us. Thank you for your comment. I’m really glad you liked the review. Yes absolutely, I believe surveys have been carried out, and public speaking is a top fear that most people have. On a similar note, I believe public speaking is one of the top ways to increase our self-confidence. Thank you for dropping by and adding your valuable contributions to this post. It’s lovely to meet you. Thanks for responding to Hiten’s review of my book. Ironic as this may sound but when you learn to Speak from the Heart you are touched by a higher power and the fear of public speaking is diminished. In the book I show how this is achieved through creativity exercises of expression. I hope you will explore what my book has to offer and that fear of speaking will become a thing of the past. God Bless. I agree totally Hiten, Great book review. When we speak from the heart the real person comes out. It means you are not saying what you think people want to hear, but how you feel. I have not done any public speaking other than years ago, but this does sound like a book , as you say, that we can learn from when it comes to writing also. thanks very much the the tip. The key to life is always keep learning. As the author of Speak from the Heart it is great to hear all of this resonance through Hiten’s blog. Your quote: “When we speak from the heart the real person comes out.” It certainly does and that is why I advocate my approach to public speaking so strongly. When the real person turns up the world takes note. I hope Speak from the Heart will inspire you to get back into the world of public speaking. I’ve been thinking about this the past couple of days and have been practicing it with people in my daily activities. I’m finding when I add strong passion and ‘soul’ to what I’m saying even in just conversation, others respond to me differently and more positively. You’re right, when we speak from the heart, we allow our real selves to come out. I really appreciate you sharing your wisdom with us. As you say, the key to life is to keep learning. Thanks for sharing this, Hiten. Indeed heart-mind connection is the key to doing anything fully, passionately and successfully. when it comes directly from our heart-mind we come the ultimate understanding or ourselves. This understanding is pure intelligence. How do you get to pure intelligence? Include our heart-mind in the process. The head mind is filled with intellectual rambling. When attuned to universal mind, we cannot help but speak with the feeling of being whole and complete. Thanks for responding to Hiten’s review of my book. I liked your line that “we cannot help but speak with the feeling of being whole and complete” without being totally resonant with ourselves and our environment (& audience) – that is so true and reflected directly through the words and essence of Speak from the Heart. I hope you may take the opportunity to enjoy the resonance of my book. It’s lovely to see you, my friend! 🙂 I hope you’ve been well. I knew you would be able to relate to this review and to the way Bobby teaches public speaking. I’m aware you are also a strong advocator and teacher of firstly recognising the heart-mind link (understanding ‘pure intelligence’ as you say) and then using this to create positive changes in our lives. Indeed, when we tune into the universal heart, we can use the collective strength of all of us to powerfully live our lives with our heads held high, and speak with true passion. That is a very good review for an interesting book. Thank you for sharing. Personally I haven’t spoken to the big public but I have provided some training courses several times during my professional experience as a consultant. My public was composed by people older than me and I had to be present and achieve their attention and respect. My course was very well prepared and I did it very well. I remember once, at the end of the 4 day course I was sick….I had a fever and I guess it was just because I was completely exhausted. I gave all my energy and passion during the course! Thank you for this review. I like it a lot because you tell your personal point of view! Thank you so much for sharing your experiences of speaking at the training courses. Indeed, it sounds like you did a fantastic job to gain the respect of your audience. You must have done brilliantly are creating strong trust and demonstrating yourself as an expert in your field. Passion is such a powerful emotion Lenia. I personally love it! I hope you enjoy Bobby’s book as much as I did. It’s so wonderful to see you as well. Thank you for leaving your comment here. I appreciate your support. It can be exhausting when you first begin to speak from the heart. It is a bit like exercise – you need to build stamina. Hiten points out that I give short exercises throughout each lesson and I do that purposefully to build the resilience required. Facilitating training courses can be a real challenge but I’m certain you and your clients will have got the best from your efforts. Thanks for promising to put my book on your “to read” list – I sincerely hope you enjoy it and get great value from it.